Making some simple positive changes can have a big impact on your life. If you want to succeed, it doesn’t have to be complicated. It is all to do with developing some success habits. Even shy people can develop these habits, just like I did. These positive changes will help you if you are shy, feel like you need more self confidence or more belief in yourself. I am a quiet person, always have been. When I was younger I was tormented by low self esteem, I used to get tongue tied whenever I spoke, which wasn’t very often! I just didn’t have the confidence to speak up. I had no belief in myself. I was unhappy at work and I felt so self conscious that I sometimes made mistakes. These audios were a turning point in my life. Jim’s philosophy was that you could work on yourself and make yourself more valuable. From here I searched out books and more audios and I began to apply the information that I was discovering and took small steps towards improving my life. I gradually began to step out of my comfort zone. I realised that I could change and that I could accomplish anything I wanted. I spent time on Personal Development every day. We have a wealth of information at our fingertips. Personal development is your secret weapon. Read 10 pages every day. If you find it hard you’re not reading the right book. I started to make a daily ‘To Do’ list. Recognise your small achievements and strengths and rewards yourself. It takes a bit of work to start thinking in a positive way all of the time, but it soon becomes a habit. Until you have mastered it you can repeat affirmations to yourself daily. If you enjoyed this post, why not visit my website www.adeledecaso.com/free-chapter and access your free chapter of my book Shy People Can Be Successful Too! You will also receive my Top 10 Tips for Shy People. 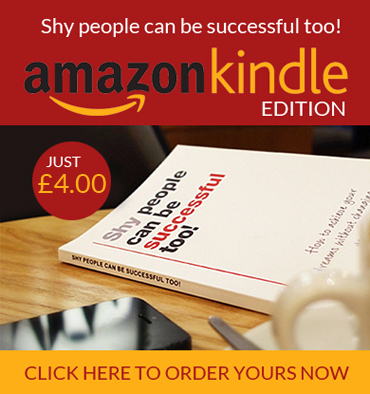 You can also like my facebook page Shy People Can Be Successful Too! This entry was posted in Blog and tagged Belief, Law of Attraction, Personal Development, Positivity, To Do List, Visualisation. Bookmark the permalink. visiting this site dailly and take pleasant facts from here at all times. this website includes amazing and actually excellent material in favor of visitors. I really like the valuable info you provide with your articles. I am going to bookmark your weblog and view again here regularly. I’m quite sure I’ll learn plenty of new stuff below! Have a great time for the next! We are a team of volunteers and starting a brand new initiative inside a community inside the same niche. I actually do trust all the ideas you possess offered for your personal post. time? Thanks for your post. You must proceed your writing. I’m sure, you’ve a fantastic readers’ base already! blog before but after checking through a few of the post I realized it’s a new comer to me. post is genuinely a pleasant post, ensure that is stays up. is simply nice and i can suppose you’re a professional on this subject. To start with I would like to say awesome blog! I had a brief question that I’d want to ask should you don’t mind. of writing. I’ve had a hard time clearing my thoughts in acquiring my ideas available. just trying to puzzle out how to begin. Any suggestions or tips? Hi there, I know what you mean! What I find helps is delving into some form of personal development before writing. This could be reading from a book or watching a YouTube video on one of my favourite subjects. I also have copious notes on my phone and in notebooks that I make whenever I get an idea for an article or a book. Once I have read for 5-10 minutes I find I am in the zone for writing and the words flow far more naturally. Hope this helps! Hi there everybody, here every person is sharing these kinds of know-how, thus it’s nice to read this website, and I used to go to see this weblog everyday. Wow! Eventually I got a webpage from where I can truly obtain helpful facts concerning my study and data. Wow, this paragraph is nice, my sister is analyzing these things, thus I will let know her. not to discuss such issues. To another! Cheers!! Excellent way of telling, and pleasant article to obtain information on the topic of my presentation focus, which i am going to deliver in university. not omit this website and provides it a glance on a constant basis.